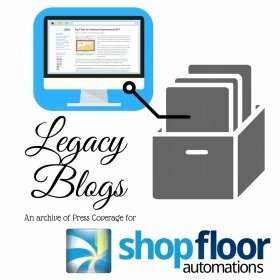 The Shop Floor Automations blog is dedicated to preserving the history of our company. Here is the latest news we would like to share. Our popular piece about millennials in manufacturing jobs continues to make its way through our industry. Haas Technical Education Centers published the piece on their blog recently. We also have some vintage news pieces we would like to share. This piece from Manufacturing Engineering Media (from SME) in 2014 features an interview with our company President Greg Mercurio. This piece from June of 2012 by MFG News was from a time when our floppy drive emulators were still fairly new. American Machinist also published this piece in December 2016 about how recent Scytec updates meant even more MTConnect compatibility. If you would like more information about how to increase productivity on your shop floor, call (877) 611-5825 or fill out our contact form. Want to see some reasons why customers have stayed with us? Check out our reviews!